Around The Mulberry Tree | Sourdough Baking Classes, Micro-bakery, Growing, cooking, preserving and renovating around the mulberry tree. I think my last post was our annual gingerbread house demolition, so it’s been a while! The easiest way to bring things up to date was to randomly select a range of photos and tell the story of each. It has been incredibly busy day-to-day, add a long harsh summer with bizarre weather conditions, virtually no rain and loads happening in my world of sourdough. As I keep saying, this retirement gig is hard work! So here’s the update in pics. This pushed me into finally setting up an online store which was an interesting challenge…. I eventually managed to navigate my way around this and am very proud of my Simply Sourdough site. It is a good way of selling everything in one space and I am amazed at how it is going. On the reno front, we have just about completed the main bathroom. Some fittings, filling and painting of trim and it will be done. Of course these last-minute things will take longer than the whole build did! My little right hand man in the kitchen just loves doing anything with creating food. He told me the Canele custard (pre the rum addition) was just like making milkshakes! Loves donning his Celia apron too! The finishing touch on the Canele. This was about the best pick from our crappy tomato season. Wasn’t worth planting this year. Something that came totally out of the blue was being approached by Gippsland Magazine to see if we were willing to have an article about my little bread business and our home run in it. I was nearly beside myself thinking they’d not find enough to talk about, but all went well and we featured on the front cover! That’s a bit special and testimony to all the hard work we have done. The magazines a great way to learn more about our region. As well as my weekly community bread bakes, I’ve had a few special event bakes and did a presentation to a large group at the ‘Women on Farms‘ event held at Gippsland Community college about baking sourdough. I quite enjoy doing these presentations, especially when I receive thank you gifts such as this lovely tea towel designed by Rachel Flynn at Red Tractor Designs. I love this but Mr ATMT doesn’t have the same level of appreciation for it as I. I’ve been playing around working on a 100% sourdough baguette and I am getting close to being satisfied with it. Nothing I Googled really resembled a classic baguette which is what I am aiming for. These were for a special order on a grazing table and they kindly sent me a crumb shot. Nearly there with this formula! Getting my creative side on with this arrangement of cotoneaster, spent agapanthus heads and coprosma cuttings. So basically its a bucket of weeds! Quite pretty if I say so myself. Lastly for the Catch up snippets, team Dad ‘N Dave have returned from their trip to Nepal as part of the Habitat Australia earthquake victims home rebuilding project and feel their contribution to the cause was valuable. Such trying conditions and extreme levels of hardship on these people make you wonder how they maintain the happy dispositions they have. A huge thank you to all those who supported Geoff and David in this project. Let’s see if I can get another post in before Christmas! We live a life of great fortune. Beautiful healthy family, well fed, a home that could accommodate several, health benefits, heating, education, good wine……..the list just goes on and on and still, on even further. There is not often we get the opportunity to REALLY help others. I often do a gratuitous donation here and there and I’m happy I’m in the position to be able to do so, but it’s nice to be able to offer a little more. We’ve both toyed with the idea of doing some volunteering abroad over the years and now Mr ATMT (Geoff) is being joined by our son (David) to go to Nepal in March of 2019 to be part of a team who assist rebuilding homes for the hundreds of thousands who suffered devastation in the earthquakes of 2015. 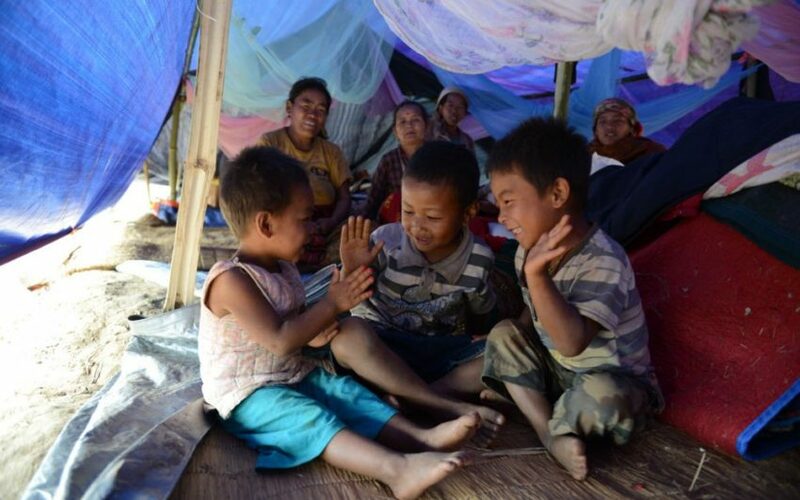 The following pictures convey just a tiny fraction of the impact the earthquake had on Nepal. 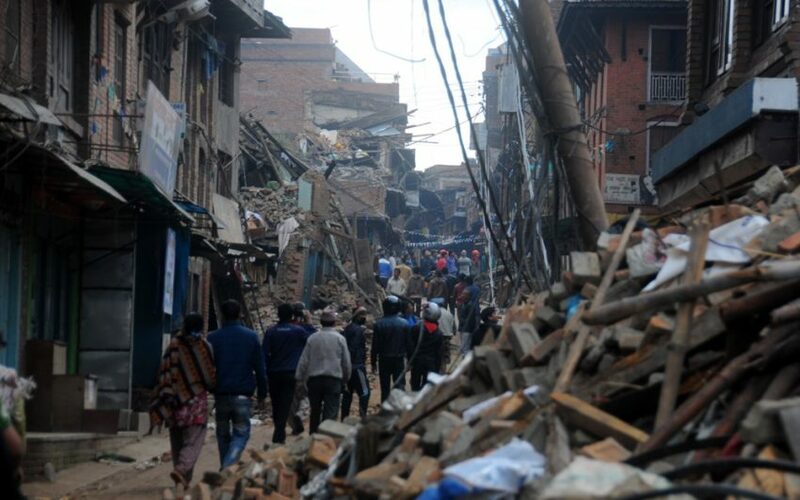 “A magnitude-7.8 earthquake struck Nepal on April 25, 2015, toppling multi-story buildings in Kathmandu, the capital, and creating landslides and avalanches in the Himalaya Mountains. Nearly 9,000 people died and more than 22,000 suffered injuries. It was the deadliest earthquake in the seismically active region in 81 years. Humanitarian organizations responded quickly to the disaster with search and rescue teams and immediate aid deliveries. Work is still underway to rebuild schools, health clinics, houses, livelihoods, and to help families and communities gain more resilience to environmental shocks”. 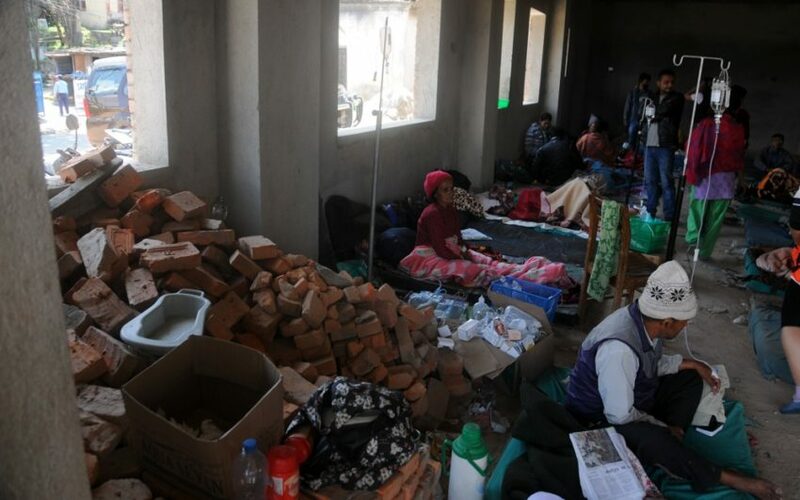 People are still relying on makeshift accommodation and facilities. There is no way known my dodgy hands would be able to cope with offering building prowess for this, so I’m offering support from home by running a sourdough class (or 2 or 3 if numbers are warranted) where the entire takings are going to the fundraising component of this venture. I am putting every single dollar from my November Sourdough Baking Classes into the coffers. I am also offering 10 gift vouchers for classes where 50% of the value will go to the fundraising. This means that the cost of your class or voucher can be claimed as a taxable donation! If you are interested in attending a November class or purchasing a gift voucher send me a message or email me before you commit to ensure you get the taxable receipt. Aren’t children amazing with their resilience? Just a bit of area covered! It is extremely difficult to imagine how people endure such levels of devastation and loss and sadly we just keep on hearing more and more about it happening globally. Is it because of our high level of connectivity we hear about it, or is it really on the increase do you think? Regardless, if we can toss in a bit of support, all the better. Geoff (Mr ATMT aka Dad) has selected the Habitat for Humanity program as his preferred focus. Heaven knows, there are so many worthy programs and causes it becomes a matter of just picking one and going for it. We fund travel, accomodation and personal expenses but fundraising needs to be done for contributions towards building materials, technical assistance and ongoing support. If you would like to offer some financial support to their team feel free to make a donation of any amount by going here to Team Dad N Dave. Please share and if you know of anyone who may be interested in doing a sourdough class please let me know. Here’s to a few more people having their very own roof over their heads! It keeps happening, turn around, blink, lose focus for a minute and another year has passed. It seems amazing that our baby grandson has now turned one year old and his brother will be turning 3 in January. We are so lucky to not only have these 2 little tackers in our lives, but we are extremely fortunate in that they live close enough for us to get to enjoy them often. Such a cutie, but starting to demonstrate some extremely strong straits of determination and stubbornness. Just the thing to get through this maze of life. His mum (my daughter) doesn’t do many cakes these days, a shame as I think she has an amazing talent. This blue whale white chocolate fudge cake managed to turn everybody’s mouths blue as well as look stunning. Both the boys love getting out into the garden, a sure-fire way to soothe a bad mood and redirect anxiety when necessary. A special little basket makes collecting and harvesting a real delight. Then there are questions to be answered, goals to strive for when things catch your eye. Made it! The freesia are huge this year, late-blooming but superb. One of my favourite flowers in the garden are these irises. I absolutely love them and look forward to their short display every season. These are another re-housed lot of bulbs from my sisters place that they lifted before moving. Thanks Margaret. After an adventure outside it’s back inside to an afternoon tea of sourdough French Toast and a cuppa. On the bread front, these are some baguettes I baked for the 1st birthday party. Colour is a little uneven as I tried to fit too many on the oven shelf. Tasted great though. I’ve never made bagels before, in fact the closest I’ve ever been to a bagel is the ones I’ve seen mentioned on the tele in New York delis and movies. I’m expecting a quite dense and chewy result but we’ll see. I managed to get summer vegetable seeds planted for germination last week, hopefully they will go well and the weather will be a bit consistent for a change. Just have to wait and see I suppose. Very happy to see the first asparagus for the season appearing. It really must be Spring! I’ve been finding it hard to get back into things since being away, so I decided to spend the day (even though it was glorious outside) just treating myself to a gentle time of doing things I like in the kitchen. I subscribe to Gillian Bellcake’s & Annabelle Hickson’s podcast Dispatch to a Friend and find their light-hearted, loving exchanges about their loves, lives, hardships, friendships, experiences, travels, gardens and everything in between (even home-made coffins) comforting and entertaining. I find myself chuckling away, nodding my head in agreement, tut tutting when they talk about neighbours cutting down trees, feeling sympathetic and even reply out loud to their exchanges. The ideal company to have chatting in the background while I potter around. To kick-start the day of being gentle on myself, I picked some beautiful spring flowers and set them on the dresser in the kitchen. I’m so glad there are still daffodils performing upon my return, I thought I might have missed them this season. I also picked some rhubarb and set a goal to make a rhubarb and fruit galette using freshly milled flour in the pastry. I had picked rhubarb and I knew there was fruit in the fridge that had been sitting there for a couple of months just macerating away in orange juice. Syrupy, sweet, delicious. Ideal to marry with some rhubarb. So, rhubarb and boozy fruit in a galette was what it was destined to be. I did know that I wanted to have a go at making pastry using freshly milled, organic whole-wheat flour. I recently purchased a Mockmill flour mill and I’m loving getting used to all the different things I can mill with it. The Mockmill is a compact, affordable, stoneground mill that does an astounding job of milling all different grains and spices. Here I’m doing malted wheat flakes to add to a bread dough. I had no idea of which may be a good whole-wheat pastry recipe, so out came the Google assistant. Experience has taught me that whole-wheat pastry is going to be less light and delicate than white flour pastry but that’s ok. The nutty flavour and the extra nutritional value whole-wheat offers is a bonus. I’m also looking for the rustic feel with this dish. I want to include more whole-grains and organic food into my diet whenever possible. This is where it gets a bit spooky! The first Google hit returned a site called ‘Local Is Lovely‘ and it took me straight to a post about Gillian Bellcake’s Rhubarb & Crab Apple Tart, it’s not a whole-wheat pastry and nothing like what I was looking for, but how could I not give it a go seeing as I was listening to Gillian chatting in the background. Sceptics would say this is the cyber tracking spies at work, but I think it’s magic! I made the pastry as per the recipe but used 350g organic white flour and 150g freshly milled whole-wheat flour. I also added an extra egg yolk (I only had small eggs) and a splash of water to assist the dough coming together. The pastry has rosemary in it, so off to the bushes that are currently covered in fresh, soft growth and delicate little blue flowers that act as bee bait, to gather a handful of flavour. Blitzed the flour, butter, rosemary, egg yolks and a splash of water until it just came together then turned it out and worked it on my bench to form a dough. Wrapped in a bee’s wax wrap and popped into the fridge for half an hour. I have been anti ‘cling wrap’ for a very long time. Cling wrap is one of those particularly insidious single use plastics and there has been a huge amount of evidence as to the nasties it can impart back into your food that I just don’t touch it. Can you imagine how many times the world could be wrapped in cling wrap just by what kids take to school on their lunches that don’t even get eaten, but just thrown out. I usually put pastry in a container for its resting time but lately I’ve been using bees-wax wraps and I love them. After resting dough for about half an hour I took the pastry out, rolled it and plonked the fruit and chopped rhubarb into the centre. I kept the surplus trimmings and popped them into a container in the freezer to use on another day. A quick turning the dough edges to the centre, a bit of what I refer to as ‘rusticating’, a couple of patches and the galette was ready to bake. I baked this in my little Wood fired Nectre Bakers Oven that we installed as part of our kitchen exteno, what a great little unit this is. We don’t have any hydronic heating at the moment, so the Nectre has been put through its paces this week keeping the back part of the house warm. Seems to have turned out well, I tasted a couple of crumbles from the pastry and it is delicious. This is for dessert tomorrow night when the kids come, so I’ll let you know how it goes. Definitely will be adding some extra thick dollops of cream to it when serving, I may even whip up some of the condensed milk ice-cream I heard the girls talking about. That brought back memories from my childhood, condensed milk ice-cream, made (without an ice cream churn Annabelle) and set into aluminium ice-block moulds in the fridge. Better get out the Google assistant again to find a recipe for that. Who nows where I’ll end up! I may even make some rhubarb syrup to pour the fruit in the centre too. and see the beautiful ‘unrusticated’ creation that was made by Gillian. Poles apart from what I’ve done with my creation, but that’s the joy of baking, make it work to suit you! To subscribe to Dispatch to a Friend podcasts, go to this link or iTunes. Due to demand, I have added an extra class to the Introduction to Sourdough Baking schedule. Sunday 16th September, 10.00-3.30ish. Go to Simply Sourdough tab or to my Facebook Simply Sourdough Events Page for event details. Tickets can be purchased online from Sticky Tickets, price of $154.50 includes booking fee. Gift vouchers available, contact me direct for details. I’ve added couple of new tools to the kit this month. I would say I’m generally not a gadget fan, but I found my citrus zester was hurting my hands when I held it, so shouted myself to a new one, same brand but with a different shaped grip and grating head. I bought this online from Peters of Kensington and arranged a ‘Pick Up In Store’ as we went to Sydney the following week. This little item is a bit more fanciful! A cup for making lacy rice paper wraps. When we were in Vietnam many dishes were served in beautiful looking lacy wraps and I haven’t been able to find any here. I tried making them using an old squeeze sauce bottle but it didn’t work. I used this to make wrappers for the Dadar Gulung (Indonesian Pancakes) that are made by making a rice flour batter and adding green pandan colouring. They are filled with a delicious filling made from coconut, brown sugar and sweet milk. Very delicious even though the colour is something you should only use for St Patrick’s Day cooking. These aren’t mine, I forgot to take a photo but this is pretty close to what they did look like. The batter cup obviously takes a bit of time to master. In my kitchen was the BEST pork crackle I’ve ever made. I did pulled pork in the slow cooker so removed the skin, scored it and let it sit uncovered in the fridge overnight before rubbing with salt and olive oil than baked in the oven. I then crunched it into smaller pieces and scattered over the pulled pork. I made soup using my frozen chicken feet stock, red lentils, carrot, onion and served with greek yoghurt. Love the autumn colours! I was fortunate to be gifted some kefir grains by a member of my Facebook Sourdough group. I’ve started exploring further afield with fermented foods and still have a lot to learn, but we are loving using kefir in many dishes. This is Bothe the water kefir and the milk kefir grains doing their thing. I have also been making a lot of Labneh which is yoghurt cheese. So easy to make and these are just little balls of Labneh that I have marinating in oil, chilli, garlic and peppercorns. They are great as a spread on bread or crackers or just served on a platter of other nibbles. My apprentice has been helping too, here are the results of him helping with pancakes made using kefir water. Hard to smile when your mouth is stuffed full! We have been a bit slack with our weekend special breakfasts but this made up for it. Mushrooms cooked with chilli and garlic, poached egg on sourdough and a little chick pea dip on the side. Fresh OJ from oranges picked from our tree, eaten in front of the fire. One of the loaves I offered in my weekly bread orders was a caramelised onion loaf. I had 7kg worth of onion tops and skins, so turned them into onion stock. Very easy, chuck the lot into a pot, cover with water and cook away until you get this beautiful rich liquid. The scraps then went into the compost, no waste at all! Probably the nicest thing In My Kitchen this month is this apple danish. I attended the most wonderful day learning about making croissant and danish at The Artisan Crust in Cockatoo and I can’t recommend them highly enough. Every part of the day was sensational! Scott is a highly trained professional that clearly loves what he does and is happy to share his skills openly. So that’s what’s been In My Kitchen the last month. Thanks to Sherry from Sherry’s Pickings blog who gives us the chance to share all the kitchen loveliness. Head over there to see what others have been up to. Wish Sherry a very happy birthday too while you are there. Then they were dug into the soil. I’ll repeat digging them in in about a week or two. The only things I really have planted are snow peas, leeks and I discovered some fairly decent broccoli in among the green manure so that’s now clear. I can categorically report that CD’s do not deter birds from devouring lettuce plants. All the literature states that you should time planting your peas so that you avoid frosts that will damage the flowers, therefore setting. This little tacker must have just made the safe zone, we’ve had a couple of ripper frosts. This little section is where all the spent veggie crops like tomatoes, corn stalks and any other ‘past it’ plants are tossed. I topped them today with all of the leaves that had been raked up between all the veggie beds and in the berry house. This will just sit now until spring and be used as the spillover planting bed. The rhubarb and Warrigal Greens are really shining and after a bit of a tidy up things feel much more in control, damp and dreary, but in control. This pic of when the back yard was just getting set up, 5 years ago. The following 2 pics are where it’s at now. There are a couple of really pretty things performing in the garden at the moment. This little flowering gum is called Purple Patch, it is a smallish tree with a weeping habit. The tiny purple flowers appear in winter but I prefer the buds. The Eucalyptus caesia or Silver Princess, would have to be one of my favourite plants. Every single part of this tree is special. The form, the bark, the buds, the flowers, the colour, the nuts, the fact the birds love it and the way it gently waves in the breeze. The planting in the courtyard is taking shape well, I can’t believe how quickly the olives are growing. The mandarin tree is ready to be separated from its bounty one by one as the little fella just loves them. It doesn’t appear that the second grandchild is going to be any different with his love of food, any food. The significant difference is that this one is not a neat and clean eater like his brother. He stuffs anything and everything in with gusto and gurgles with delight as its being eaten. He thoroughly enjoys spreading it far and wide and making it last, going back picking up his scattered bits. Pleasure to see! It is a matter of getting the pressure washer out regularly, placing drop sheets where he is eating and having the brush and dustpan close by, but that’s OK.